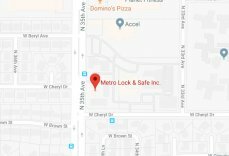 Services A Locksmith Can Offer You | Metro Lock & Safe Inc.
You never really think about needing a locksmith until you desperately need a locksmith. Luckily, good locksmiths offer a variety of services for you so you can get back to your daily routine as soon as possible. No matter the crisis or situation, whether you need a replacement key quickly or find yourself locked out of your car in a strange parking lot, a good and trusted locksmith can help you through it. It may even be worthwhile to have a locksmith phone number on you at all times just in case you require their services. A locksmith can do any number of things that can help you out when you are in trouble. The standard locksmith services are the ones everyone seems to be familiar with already. A locksmith can assist with lockouts, re-keying locks, mailbox locks, lock repair, and key duplication. Any time you find yourself in a situation where you need a locksmith, they can be there to get you on your way. The most common services involve lockouts, as people tend to forget and lose keys often, especially when their minds are on other things. The standard locksmith services don’t require a lot of trouble and can get you out of tight spots. If you are interested in getting more serious with your security, a trusted locksmith can help you out there as well. Consulting and assessment are services offered by many different locksmiths, and include high security locks, electronic locks, alarm systems, padlocks, master key systems, and cabinet and drawer locks. These more detailed devices and tips can get you the high security you need and want without any trouble. These are great for busy neighborhoods and areas where crime rates are higher than average. Every home should have some form of safe to protect important documents like tax information, social security cards, and birth certificates. A locksmith is an expert in many different types of safes, and can get you set up with a model that works best for your needs. Safes come in many different forms, from standalone models to wall safes to high security safes, and finding one that will work for you can be a little confusing if you are unfamiliar with what is out there. A locksmith can help you narrow the choice and get you set up with something that works for everyone involved.